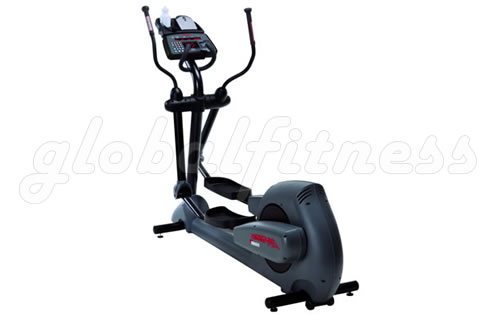 Utilizing both dual arm bars for upper body toning, and traditional elliptical machine foot plates, the Life Fitness CT9500HRR is one of the more popular crosstrainers in gyms today. Precisely monitor your heart rate with the patented Lifepulse™ sensors, one of the most accurate heart rate devices available. You can check your workout progress on the well-lit alpha-numeric message center, and verify your standard measurements as well as METS, Watts, calories burned, RPM, and distance. Since the unit is self-powered, weighs only 235 lbs, and makes use of rear wheels for easy mobility, you don't have to be Mr. Olympia to place it anywhere in your home or gym. The CT9500HRR comes with a reliable, rear-stationed belt-drive system with proven alternator resistance, so you should enjoy long-lasting performance. A welded steel frame adds more to the durability aspect of the CT9500HRR. Plug in your Polar® heart-rate strap at any time, or take advantage of the optional settings; the CT9500HRR is CSAFE Compatible, which will bring you FitLinxx™, Cardio Theater®, or Broadcast Vision. Dimensions: 80" X 27" X 66"